All rates are listed in US Dollars (USD). To register, you will need to log in using your TCTMD username and password. If you don’t have a TCTMD account, please click here to sign up. Allied health professionals devote a majority of their professional activity to the direct care and treatment of patients with cardiovascular disease. Examples: Nurses, technologists, physician assistants, research specialists, pharmacists, and hospital administrators. This also includes allied health professionals who are actively engaged in teaching or research. Examples: Nurse educators, basic scientists, and biostatisticians. Please note: Allied health professionals who are employed by companies in the cardiovascular field who do not provide direct patient care are not eligible for this rate. Physicians who are actively practicing medicine in a public and/or private institution or who are actively engaged in teaching or research. Please note: Physicians who are employed by companies in the cardiovascular field who do not provide direct patient care are not eligible for this rate. All individuals who are employed by industry, including physicians and allied health professionals, and those involved in finance, do not qualify for the other registration categories. To complete the registration process, you must submit a credit card authorization form and confirmation of your status as a current fellow at the time of TVT 2019: Structural Heart Summit along with your planned graduation date. 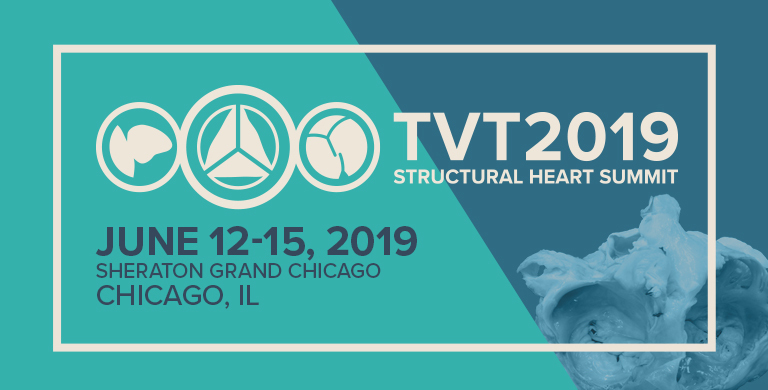 To be eligible to register for TVT 2019: Structural Heart Summit as a fellow, your expected graduation date must be June 30, 2019, or later. Your card will not be charged at this time. However, in the event that you do not attend or do not cancel within 24 hours in advance of the Event, US $50.00 will be charged to the card on file. Email your proof of current fellowship, along with your credit card authorization form (a link to download the deposit form will be provided once you submit your registration for TVT 2019: Structural Heart Summit) to Danielle Goodman at crfmtgdeposit@crf.org by Wednesday, May 29, 2019, to complete your registration. Fellows who do not provide proof of current fellowship and a credit card authorization may not be eligible to attend TVT 2019: Structural Heart Summit for free. Fellows registering on-site MUST provide proof of fellowship before being able to collect their badge. Fellows that do not cancel at least 24 hours prior to the Event will be charged a $50 No-Show Fee. Available to US Government employees only. US Government Registrants are required to present a valid US government ID to pick up their badge. TCTMD Gold Membership (1 Year): All presentations and live cases from TVT 2019: Structural Heart Summit will be available on TCTMD. TCTMD Gold gives you access to thousands of slide presentations from TCT, TVT, CTO, and other leading meetings in interventional cardiology. Gold membership also includes access to live case videos from cath labs around the world, including cases from TCT, CTO, TVT, and other CRF meetings. For more information on the benefits of TCTMD Gold, visit https://www.tctmd.com/premium. All registrants of the Event are subject to the following registration terms and conditions. These terms and conditions are strongly enforced for the Event by the organizers of the Event, the Cardiovascular Research Foundation (CRF). All cancellations must be received in writing. Cancellations received in writing before Tuesday, May 7, 2019 (by 11:59 PM ET), will receive a full refund less a $100 administrative fee. Cancellations received between Wednesday, May 8, and Tuesday, June 4, 2019 (by 11:59 PM ET), will be refunded 50% of the registration fee. No refunds will be processed after Wednesday, June 5, 2019 (12:00 AM ET). Acceptable forms of payments are credit card and US check. If you would like to pay by wire, a mandatory $75 wire processing fee will automatically be added to your total. To complete the registration process, you must submit a credit card authorization form for the deposit of $50 USD and confirmation of your status as a current fellow at the time of the Event, along with your planned graduation date. To be eligible to register for the Event as a fellow, your expected graduation date must be in June 30, 2019, or later. To receive complimentary registration, fellows are required to provide proof of current fellowship, by submitting a letter signed by their current Fellowship Program Director. Fellows that do not cancel at least 24 hours prior to the meeting will be charged a $50 No-Show Fee. A link to download the deposit form will be provided once you register for the Event. Attendees are asked to present a Photo ID at registration in order to collect registration materials. Unless you are an exhibitor or group who has arranged for an advance group pick-up of badges, individuals may only collect their own individual registration. This procedure is in place to protect registration materials from getting lost and to allow CRF to monitor accurate attendance. Registration materials will not be provided without a valid Photo ID. Each person attending a Cardiovascular Research Foundation (CRF) sponsored/managed meeting, symposia, program, event, etc, (“Event”) will be issued an Event-specific badge bearing that person’s name and she or he must have the badge bearing that person’s name in her or his possession at all times while on the premises at which the Event is taking place. THE SWAPPING, SHARING, OR LENDING OF AN EVENT BADGE TO ANY OTHER PERSON IS STRICTLY PROHIBITED. Anyone found to be wearing a badge that does not bear that person’s name will have the badge immediately confiscated and will be escorted from the premises. Additionally, the attendance privileges of the person whose name appears on the confiscated badge will be revoked and that person will also be escorted from the premises. No replacement badges will be provided, and no refunds will be made, in whole or in part, for confiscated badges. Violators of this policy – the person to whom the badge was issued, the person found to be in possession of the badge, and where appropriate the company that purchased the badge – may also be banned from attending or participating at any future Event. Additionally, in instances where an exhibiting company is found to have violated this policy, the exhibiting company will be penalized with a reduction in priority points. In cases where CRF is willing to permit a person found to be in violation of this policy to once again have access to the Event, the person or the exhibiting company, as applicable, will be required to re-register and charged the full cost of the additional registration. All decisions regarding compliance with or violation of this policy will be made by CRF in CRF’s sole and exclusive discretion. By registering, you agree to release and hold harmless CRF, organizers of the Event, from any and all claims, demands, and causes of action arising out of or relating to your participation in the Event and all meeting events, including but not limited to the use of the conference center and lodging facilities. CRF promotes the free interchange and rapid dissemination of educational content from our meetings. The slides from CRF-sponsored courses and symposia are immediately posted on TCTMD.com to facilitate scientific discourse and enhance patient care. Non-flash photography and audio or video recording using hand-held equipment, for strictly personal, educational, and/or social use, are permitted at all CRF meetings if not disruptive. Communicating through social media, including posting brief audio and video clips, is strongly encouraged (respecting embargo rules for late breaking science). However, posting or live streaming of entire sessions or live cases (the latter to respect patient privacy), and use of any CRF course content for commercial purposes, is strictly prohibited. Exhibitors may film, record, or photograph activities at their own booth for promotional purposes only upon prior written consent of CRF. You hereby grant CRF irrevocable, worldwide, royalty-free, fully-paid up license to reproduce, copy, display, perform, or otherwise use any photos, videos or audio recordings taken of you by the Event’s designated vendor during the Event for promotional use (ie, brochures, association publications, and web based media such as blogs, websites, and e-newsletters). You hereby release and hold harmless CRF and their agents and assigns from all claims, demands, causes of action and liability related to said use of the material. Any company or representative of a supplier who is not an exhibitor and is observed to be soliciting business in the exhibit hall, in another company’s exhibit space, in the aisles of the exhibit hall, or any other area of the Event deemed inappropriate by CRF, will be asked to leave immediately. Unauthorized solicitation in the exhibit hall or technical program is strictly prohibited. Personal belongings such as briefcases, backpacks, purses, coats, book bags, laptops, tablets or mobile devices, etc, should not be left unattended in meeting rooms or public areas. These items are the responsibility of their owner, and CRF will not be held responsible for their safe keeping should they become lost or stolen. Additionally, any unattended items may be subject to removal by security upon being discovered. If you have any questions regarding registration, please contact Danielle Goodman at dgoodman@crf.org.